% of All Viewing By DVR - Of the total viewing of that particular episode, what percentage was done via DVR. % of DVR Viewing On Airdate - Of the DVR viewing of that particular episode, what percentage was done prior to 3AM the day following the airdate. Indeed. We're moving on up!!!! Thanks Obama for not speaking on Sunday nights! So far his interviews and TV appearances have done far better then the recent President (except right after 9-11). Hey, I'm a huge fan of the show (one of my favorites on televisions). I'm glad to see a forum dedicated to TAR and its ratings as I always look for the fast nationals Monday mornings @ pifeedback.com. Anyways, Sunday's episode has a 60 Min. with Obama as a lead-in. The last time this happened was on 11/16/08. The line-up has about a half-hour overrun which scored approx. 25.34 million viewers and a 7.7 in the demo. 60 Min. got 25.104 million viewers and a 6.3 in the demo. TAR followed with 12.124 million viewers and a 3.5 in the demo. So, the rentention wasn't great. But, the ratings were good for TAR. I think this Sunday the rating might be slightly lower for 60 Min. (without the football to help it) say...20 million and a 5.5 in the demo. However, if TAR can either keep doing how it's been doing or push its demo up to a 3.4 or so, it would have better retention. Anyways, I'm happy that TAR has won its timeslot against orginal Extreme Makeover: Home Edition in their last two head-to-heads. Hopefully, it can keep it up. I think it deserves too. If TAR is able to keep the ratings its been getting, I think we'll get two cycles. Million Dollar Password's failure in being a demo performer in the timeslot certainly helped. There will be an overrun this week in the Eastern half of the country due to the NCAA Tournament so that will help ratings as Obama will definitely raise ratings for 60 Minutes and then the audience will stay for TAR. Thanks for all the info tg, and to RFF! And yippee for overruns on days I work late! You can watch your favorite cars taking four lefts around a track for four hours. I know that floats your boat. Fast National ratings for Sunday, March 22, 2009. CBS controlled Sunday night's ratings, but how did the network do it? Was it largely run-over from a series of close NCAA second round games? Was it a "60 Minutes" interview with President Barack Obama? It's hard to know. Among adults 18-49, CBS won the night with a 3.5 rating, nipping the 3.4 rating for ABC. FOX was a distant third with a 3.4 rating, followed by the 2.1 rating for NBC. The CW was fifth with a 0.3 rating. Overall, CBS had things easier with an estimated 13.55 million viewers and an 8.3 rating/14 share, though those are likely to change, as is the nature with life events. ABC was well back in second with a 6.5/11, comfortably ahead of the 4.1/7 for NBC. FOX's 3.0/5 and The CW's 0.6/1 followed. In the 7 p.m. hour, CBS won with the 9.5/17 combination of NCAA Tournament games and "60 Minutes." NBC was second with a 4.3/8 for "Dateline NBC," nipping ABC's "America's Funniest Home Videos" in the ratings, though ABC's show was ahead in viewers. FOX' "Hole in the Wall" was fourth, beating The CW's 0.6/1 for a repeat of "Jericho." At 8 p.m. CBS had a 9.9/16 for the combination of "60 Minutes" and "The Amazing Race." ABC's "Extreme Makeover: Home Edition" had a 5.8/9 for second. FOX's "The Simpsons" and "King of the Hill" averaged 3.5/6 between them, beating the dismal 2.9/5 for the second week of "Kings" on NBC. The CW's broadcast of "The Mod Squad" was fifth. ABC moved into first at 9 p.m. with a 9.2/14 for "Desperate Housewives." CBS fell to second with a 7.0/11 for the combination of "The Amazing Race" and "Cold Case." NBC's "Celebrity Apprentice" and FOX's "Family Guy" and "American Dad" tied with a 4.1/6, with FOX holding an actual advantage in both viewers and the 18-49 demo. The CW's movie was last. "Brothers & Sisters" had a 7.0/11 to win the 10 p.m. hour for ABC. CBS' "Cold Case" and "The Unit" was second with a 6.8/11. NBC's "Celebrity Apprentice" improved in its second hour, but still finished third. Here is the rough Fast National data (we could see quite a bit of change in final numbers on this one). With this having such a large overrun 60 minutes was the show that benefited the most (plus its Obama interview) as it won easily beat us in all demo groups and it viewers (in viewers it was the highest rated show of the night). Hard to accurately judge Fast Nationals with such a big overrun (as they will have some changes with the correction of Pacific and East Coast times. yea and this is sweeps.. awsome.. It's quite possible those numbers can fall (or rise) last year for example in a similar situation we had a Fast National score of 12.520 million and dropped to a 11.996 million. Either way its a good number for the show (I was hoping for marginally higher) but typically with overruns we get good sized increase with overruns of 15-45 minutes, after that the benefit starts to decrease. With us nearly starting on the hour it makes it easier for people to switch to the other networks without missing anything or losing much time. One thing I do want to point out. When we exclude the episode against the Oscars and we eliminate all sports overruns at this point we are actually performer stronger then season 13 (Which was the only season on Sunday to see year to year declines). And since networks tend to judge versus on same day year to year data, we are currently averaging just a little over 300,000 viewers less then All Stars (the last time we aired in the spring. Which is a decline of only 3% over two years. With most shows losing 5-10% each season that a great for our decline. And if we can manage to stay at 9.3 million or better for the rest of the season (on average) we will actually end with a higher viewer average. Soethig we really, really want to see. Editors Note: CBS’s prime time ratings include a 52-minute runover for CBS Sports coverage of the NCAA MENS BASKETBALL CHAMPIONSHIP. As a result, all regularly scheduled prime time programs were broadcast off the clock, and ratings and rankings for The Network and the individual series are tentative and subject to change. ty puddin i was close 52 min i said 45..jmo i would not have watch/dvr 60 min especialy noing obama was on there.. so that was false info fro any one like me thinging we were dvring tar..
CBS placed first in viewers for the third consecutive week and for the 20th time in 26 weeks this season led by 60 MINUTES, NCIS, THE MENTALIST, THE AMAZING RACE and CBS Sports' coverage of the NCAA MEN'S BASKETBALL CHAMPIONSHIP, according to Nielsen live plus same day ratings for the week ending March 22, week 26 of the 2008-2009 television season. 60 MINUTES, featuring Steve Kroft's interview with President Obama delivered 17.04 million viewers, its largest audience since Dec. 14, 2008. NCIS (15.84m) and NCIS (15.49m) were the top scripted programs of the week and THE AMAZING RACE 14 had 12.42 million viewers, its largest audience since November 2007. CBS weekly win was also driven by CBS Sports' four night coverage of the NCAA MEN'S BASKETBALL CHAMPIONSHIP on Thursday, Friday, Saturday and Sunday. CBS continues as the only network to post year-to-year gains in all key measures: +12% in viewers, +7% in adults 18-49, +8% in adults 25-54 and +5% in adults 18-34. -- Sunday, CBS was first in households (8.3/14), viewers (13.65m), adults 25-54 (4.5/11) and adults 18-49 (3.6/10). CBS won four consecutive Sundays in viewers. ⁮ 60 MINUTES (7:52-8:52PM) delivered a 10.4/17 with 17.04m viewers, 5.0/13 in adults 25-54 and 3.9/11 in adults 18-49. CBS was first in these measure 8:00-9:00PM. 60 MINUTES delivered its best household ratings since February 8, 2008, best viewers, adults 25-54 and adults 18-49 performances since December 14, 2008. ⁮ THE AMAZING RACE 14 (8:52-9:52PM) posted a 7.2/11 with 12.42m viewers, 4.5/10 in adults 25-54 and 3.6/09 in adults 18-49. CBS was second 9:00-10:00PM in households, viewers, adults 25-54 and adults 18-49. 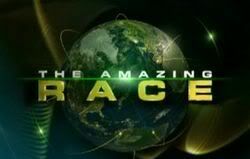 This is THE AMAZING RACE's best delivery in households and adults 25-54 since November 16, 2008 (THE AMAZING RACE 13), best viewers delivery since November 4, 2007 (premiere of THE AMAZING RACE 12) and best adults 18-49 performance since November 30, 2008 (THE AMAZING RACE 13). CBS top programs of the week: #4 60 MINUTES (an average of 17.04m viewers), #5 NCIS (15.84m), #6 THE MENTALIST (15.49m), #9 TWO AND A HALF MEN (14.12m), #10 CRIMINAL MINDS (13.74m), #11 CSI: MIAMI (13.61m), #13 CSI: NY (12.79m), #15 THE AMAZING RACE 14 (12.42m), #16 WITHOUT A TRACE (11.87m), #17 RULES OF ENGAGEMENT (11.42m), #18 COLD CASE (11.41m), #21 CBS NCAA BASKETBALL CHAMPIONSHIP SATURDAY 4 (S) (10.78m) and #28 THE BIG BANG THEORY (9.69m). FOX 6.0 10 6.0 10 n.c.
ABC 2.2 7 2.2 7 n.c.
NBC 2.5 7 2.5 7 n.c.
Wow, those are staggering numbers. To get over 10 million viewers is an achievement, but to get 12.4 million in this day and age is certainly noteworthy. Now, how much of that was an Obama bounce and from the NCAA Tournament whose numbers are up 6% from last year, we don't know, but to hold that much of the audience from 60 Minutes is very good. Yes its a great result (and unlike last time it occured we actually went up in Finals. Here is the kicker. This is the 2nd highest rated episode of AR since we moved to Sundays. Season's 12 opener after the huge Patriots Overrun is the only time we have scored higher on Sunday. Its the highest spring performance ever on a Sunday. More Historic Data its officially 10th highest viewed episode out of all 14 seasons of TAR. Only beat (not in order of viewers, too lazy). Its a great, great performance. It makes our season average push over the 10 million and gives us a 3.0 18-49 average. We would like to stay close to that. So basically what happened is this made up for the terrible performance against the Oscars. more ratings related news, any news IS good news afterall!